It's that time of year again! Canada's annual seal hunt starts today off the coast of Newfoundland. The industry is heavily regulated by the Canadian Department of Fisheries and Oceans. 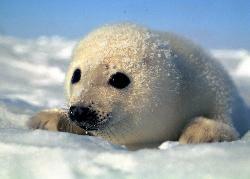 The allotted harvest this year is 325,000 seals, which is about 6% of the total harp seal population of 5.8 million. That number is almost triple what it was in the 1970s. These are not endangered species. Although animals rights organizations use doe-eyed white seal pups in their anti-seal hunt campaigns, hunting whitecoats has not been permitted since 1987. Seal hunters must buy a hunting license and apprentice under a professional sealer for two years. The hunting method is typically depicted as seal clubbing with a Hakapik. The hakapik dirctly hits the seal's brain tissue and kills the animal in seconds. Most seals are actually killed with rifles. Both methods are more humane than recreational hunting or many commercial slaughterhouses. More discussion of the hunt here. In Newfoundland, the annual seal hunt provides more than 16 million dollars of direct revenue from the sale of the product. According to the Canadian government, " Seals are a significant source of income for some individual sealers and for thousands of families in Eastern Canada at a time of year when other fishing options are limited at best, in many remote, coastal communities. Sealing also creates employment opportunities for buying and processing plants." Some 15,000 fishermen participate in the hunt, earning up to $10,000 during the two-week seal hunt. Paul and Heather Mccartney have already been out protesting, cavorting on an ice flow with a seal pup. Brigitte Bardot will visit Ottawa this week to protest. Unless the McCartneys and Miss Bardot are a) willing to do without any animal products (not just those from big-eyed animals) and b) can create a replacement industry for Canada, I'm not terribly moved by their pleas.